Michael Duff is a world class craftsman behind some of the world’s greatest violinists and stringed musicians. Duff was recently awarded a U.S. Patent for innovating a new bow, including a novel frog part of the bow. Stringed musical instruments such as the violin, viola, cello and stringed bass use bows to create classic and timeless music. 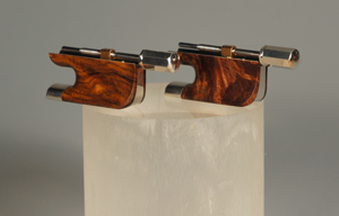 Duff is the proprietor of Berg Bows® International in Bloomington, Indiana in 1985. https://www.bergbows.com/ As a former faculty member of Indiana University’s Department of Microbiology, he utilizes his scientifically trained mind and prides himself in being involved in the handcrafting of each and every bow. Michael enlisted the assistance of Dan Lueders of Woodard Emhardt Moriarty McNett & Henry. In November 2017, Berg Bows International received a patent (U.S. 9,830,892 B1) for all violin, viola and cello bows with Berg “Sound Stick” Technology. His inventive bow was featured in Strings magazine.